British producer and writer, Ken Hill, has made a unique contribution to the cause of musical comedy and pastiche in our times, and was in the best sense a populariser. His achievements are also recognised abroad, with stage successes on the continent and in the USA. It was during preparations for Zorro - The Musical at the Theatre Royal, Stratford East, that Mr Hill tragically died in 1995. A fund has now been established to encourage staged enterprises such as associated him with that innovative London theatre and the Newcastle Playhouse. 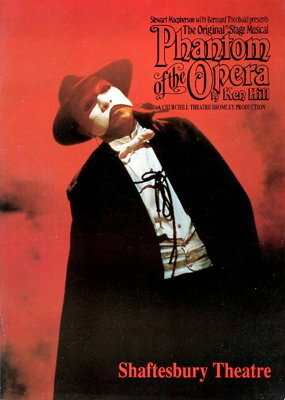 Zorro was based on a one-time kids' matinée hero, suitably 'over the top'; with the use of lively songs from Spanish zarzuelas, an amusing adventure-musical was achieved, a fitting tribute to Mr Hill. It had followed at Stratford soon after Bel Ami, an adaptation of Maupassant's cynical novel, an attractive period piece given atmosphere by Offenbach's music. Ken Hill also succeeded with themes which touched on the impossible, applying a degree of sensibility which avoided bathos: the excitement and humour were to come from genuine tension, as he wrote in stage directions. Neat allusions would add a lighter touch; for example, in The Invisible Man (1993), he adapted 1886's chauvinist song from the music halls, 'By Jingo', to 1904, the Kaiser and the Entente Cordiale. He enlivened the old tale of The Phantom of the Opera with witty dialogue. Mephisto's breath-taking entry is sabotaged when his neck gets tangled in a curtain rope, but he survives to argue philosophically with the Phantom, as to which of them really exists. An interesting word is invented: chandelierised, to be crushed by a huge chandelier dropped from a great height. In this way, the villainess, soprano Carlotta, is eliminated from the script, but the Phantom stays till the end before killing himself. The work is an accomplished pastiche, the musical era faithfully reflected in eighteen opera arias, from Gounod, Offenbach and Verdi, with single items from seven other outstanding nineteenth century composers, comprising the entire musical score. 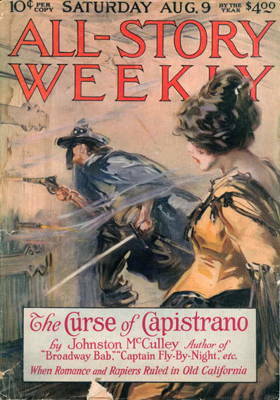 The Phantom of the Opera (1915) was an inferior novel lacking even psychological interest, a relic from the previous century's style of melodrama. It would probably have disappeared without trace except that Hollywood thought it suitable material for a silent film. Some twenty years later, it was made into perhaps the most eccentric film to emerge fron Hollywood during World War II, with the plot changed to heighten the sadistic effects. In those days, genuine opera was thought intolerable for American films, so a tasteless concoction was made from a vocal adaptation of Tchaikovsky's Fourth Symphony. 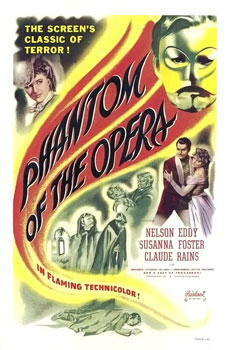 A recent American film has the Phantom usurping, from a theatre box, the title role in Gounod's Faust. There is some humour in a sub-plot, but the sentimentality is overloaded by the invention of the Phantom's father and mother. This story is at best suited for burlesque, which is not lacking in Andrew Lloyd Webber's London version, though the enthusiastic audiences are scarcely prepared for it. Most curious for our account is the opening scene, the selling of memorabilia from a very old operatic production. These relate to Robert le diable, once mentioned with hushed breath, but here no more than grist to an auctioneer's mill. Yet inexplicably, none of Meyerbeer's splendid music is to be heard. Surely the choice of opera was not random? 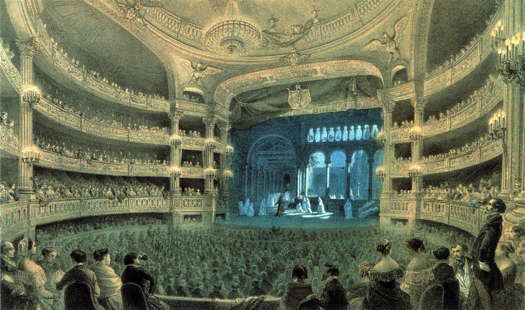 Perhaps it was included with a special sense of occasion; on this same theatre site, a fire intervening, the opera had been performed in 1847, and with Jenny Lind making her London début.